Now on instagram! 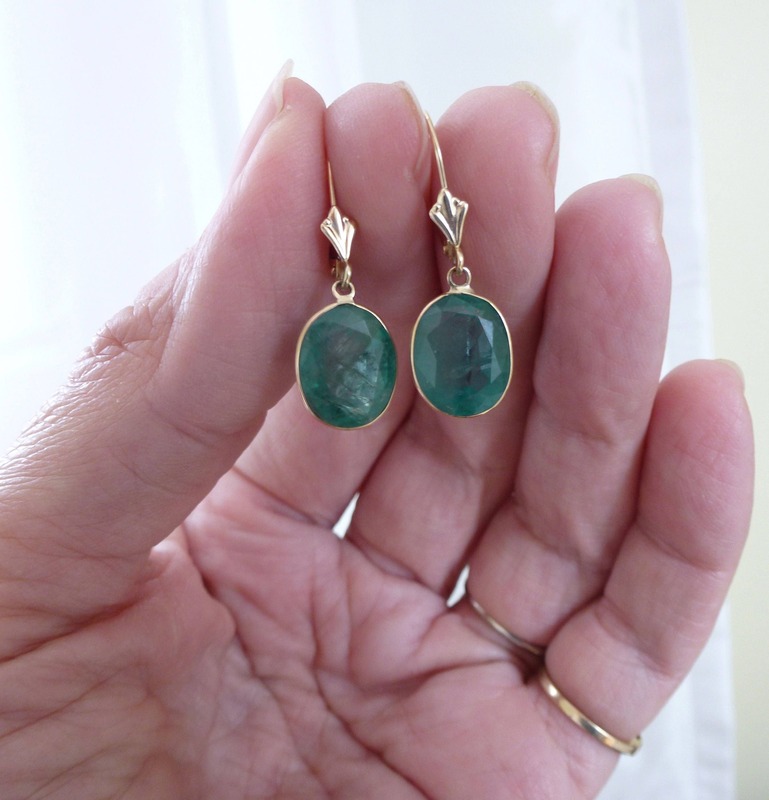 Follow #romancevintagejewels to see all the latest photos and jewelry! 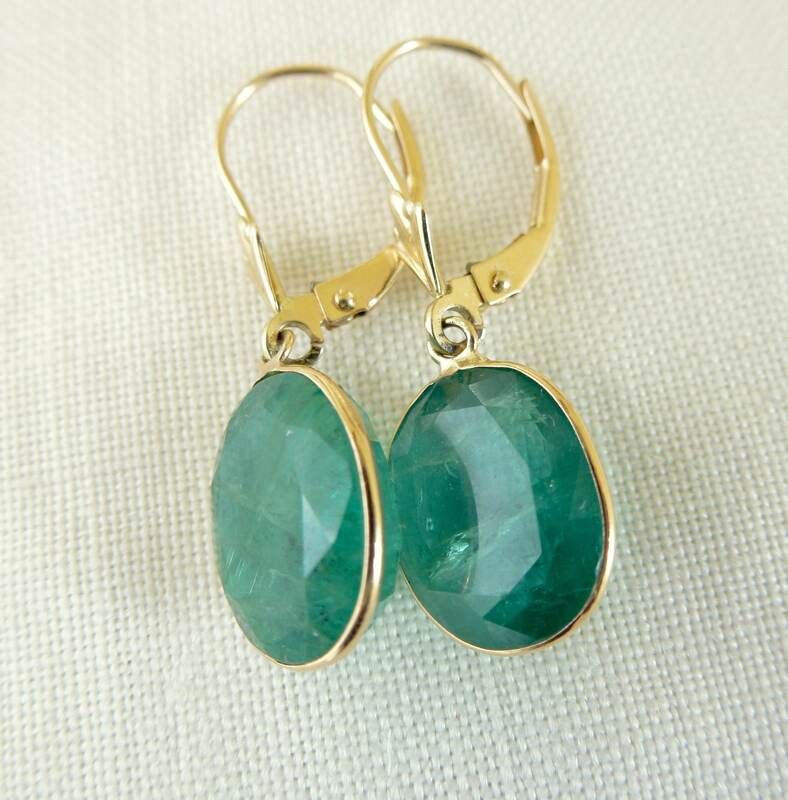 Now, here are a fabulous pair of HUGE natural emerald earrings set in 14kt yellow gold! The total carat weight is 7.6 carats in a pair of beautiful open setting earrings. You can really see the stones, truly appreciate the tremendous size and depth of each one. 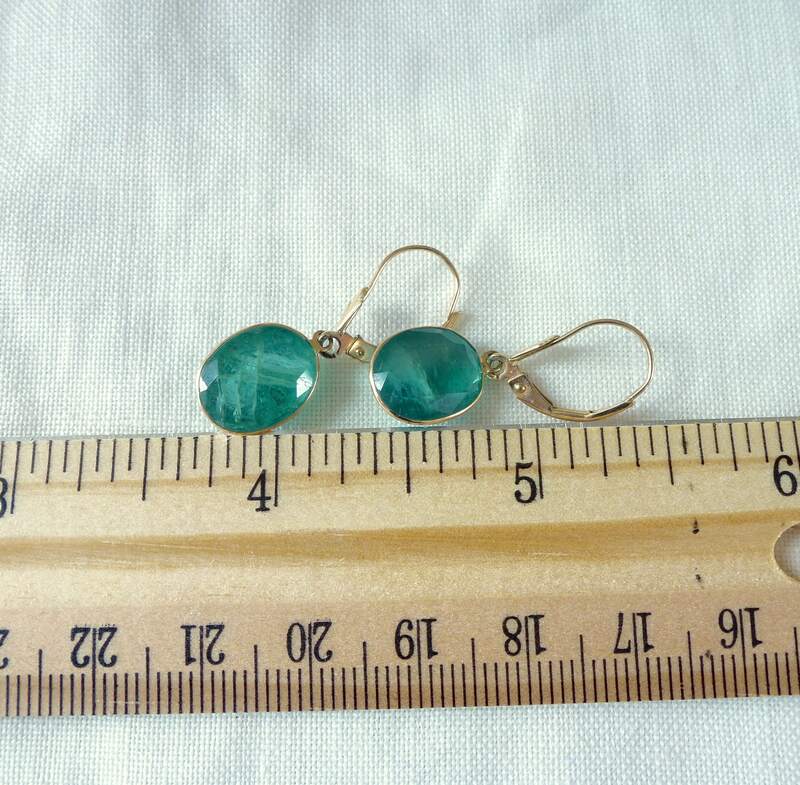 They do have some natural inclusions as you can see, but are not completely opaque. I assume that they have standard emerald treatments for clarity, usually oil. These are marked 14K P, which places them as being made right around 1980, the only time this mark was required (P meaning "plumb" or exact). Can I say enough about the emeralds? Just look at the photos, they simply state it all. 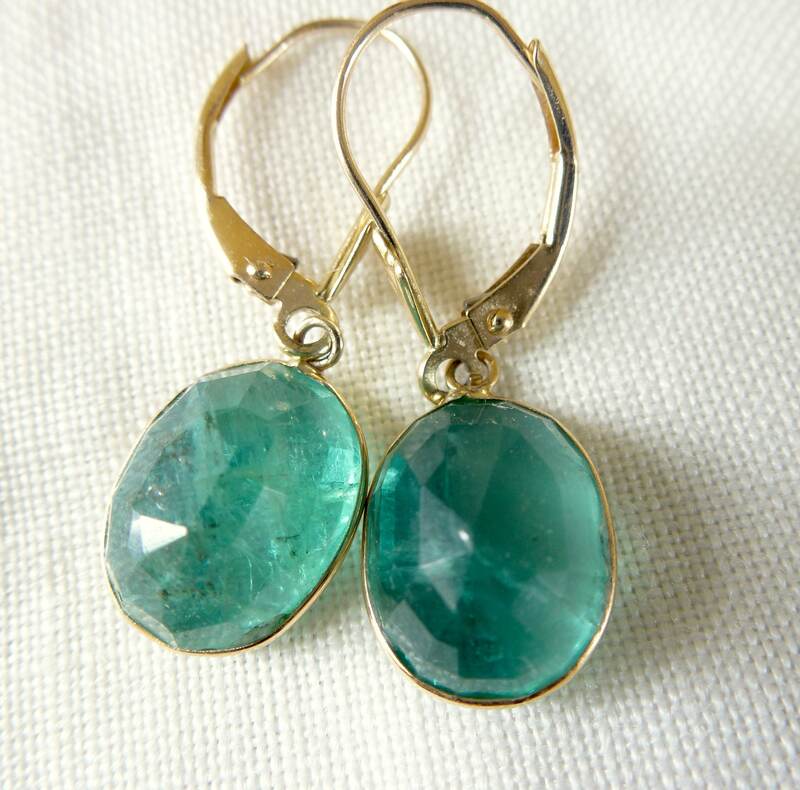 These earrings would make a terrific gift, most especially for yourself! Will arrive in a beautiful presentation box with a fabulous rose colored ribbon! If you need extra time to pay for a ring, contact me about my layaway plan. You can find the details in the policy section of my shop page or on any item page. If you would prefer to receive your jewelry right away, PayPal Credit is another way to buy what you want with up to 6 months of interest free financing. It’s like my layaway plan, except that you get your item without waiting. Just choose PayPal Credit at checkout! or by clicking on my shop! PLEASE READ: If you are outside of the U.S., please read my shipping policies prior to ordering!!!! Payment is through Etsy's Direct Checkout which offers many options. If you need to pay in any other way, please contact me. I also accept Etsy Gift Cards! I do offer layaway on items over $150.00. There is the initial deposit of 1/3 of the total price, which includes shipping and the layaway fee, and is non-refundable should you default on future payments. The layaway fee is $5.00. Length of layaway depends on the cost of the item, but is usually limited to three months. Item will ship once payments are complete. Layaway items are non-returnable. If payments are not made within two weeks of the invoice being sent, the layaway shall be considered cancelled and any monies paid are forfeit. Please send me a convo if you are interested in this option and I will reply with instructions on how to. I have received several requests to "hold" an item and so I will now offer to hold an item for up to 24 hours only. You just need to send me a convo and let me know when you plan to purchase. I ship within the US via First Class with insurance, unless otherwise noted in the listing or if you choose an upgraded shipping option. Shipping insurance covers the package until it reaches your mailbox. On orders over $750, a signature will be required. I generally ship as soon as I possibly can, often on the same day. If you are having a ring sized, this generally takes about a week. International customers are responsible for all fees associated with shipping to their respective countries. Orders that are shipped to countries outside of the United States may be subject to import taxes, customs duties and fees levied by the destination country. The recipient of an international shipment may be subject to such import taxes, customs duties and fees, which are levied once a shipment reaches your country. Additional charges for customs clearance must be borne by the recipient; I have no control over these charges and cannot predict what they may be. Customs policies vary widely from country to country; you should contact your local customs office for further information. WARNING: Items going to the European Union are subject to very high import taxes (VAT), please consider this before ordering. When customs clearance procedures are required, it can cause delays beyond the original delivery estimates. It is against the law and I will not mark an item as a "gift" to avoid any fees. If you are unhappy for any reason, please contact me within 14 days of receipt of your item and we will find a way to make you a happy customer! Buyer is responsible for return shipping costs, but the full price and original standard (not upgraded) shipping will be refunded to domestic buyers, international shipping is not refundable. If the item is not returned in its original condition, the buyer is responsible for any loss in value. If you have had a ring sized, the sizing fee is not refundable. Your personal information will only be used to contact you about your order and to fulfill the order. Most rings can be sized up or down 3 or so sizes, in some cases that is not so and I have added that information to the description. It takes my talented bench jeweler about a week to complete the work. Can an item be returned? Yes, I offer a 14 day, return for any reason policy. That is from the date of delivery. What are your layaway terms? I do offer layaway on items over $150.00. There is the initial deposit of 1/3 of the total price, which includes shipping and the layaway fee, and is non-refundable should you default on future payments. The layaway fee is $5.00. Length of layaway depends on the cost of the item, but is usually limited to three months. Item will ship once payments are complete. Layaway items are non-returnable. If payments are not made within two weeks of an invoice being sent, the layaway shall be considered cancelled and any monies paid are forfeit. Please send me a convo if you are interested in this option and I will reply with instructions on how to.